I’ve been to PGA Commons myriad times, walking the pretty brick thoroughfare up and down PGA Boulevard West. Most of the time I’m hurrying to meet somebody, barely looking up except to check my phone and make sure I don’t trip over a tiny dog or a kid with an ice cream cone. 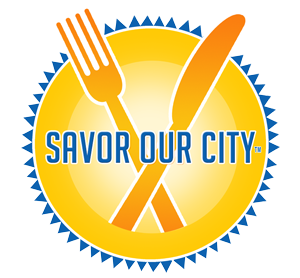 But last Wednesday, I and a small group of other foot travelers strode the Commons with a purpose – and some fancy paper fans – for the latest installment of the Savor Our City tour. The fun of the Savor Culinary Tours, led by PR guru and foodie Denise Righetti, is two-fold: to get the hungry and the curious to literally savor the goods at selected restaurants in a designated area, including PGA Commons and Delray Beach’s Atlantic Avenue and Pineapple Grove, and also to stop and see the area itself in a different way. Between the meatballs at Vic and Angelo’s, oyster shooters at Spoto’s Oyster Bar and spicy edamame at Kabuki, Righetti drops some savory knowledge about the origins of the area’s settlement, or the specifics of the art pieces that color the walk.